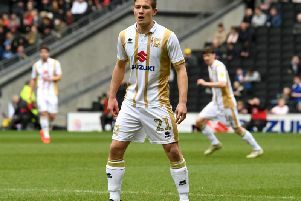 MK Dons have to do their talking on the pitch after they slipped to within a point of the League 1 relegation zone. Having picked up just eight points from the last 30 available, Dons could drop into the bottom four on Saturday if they lose to Northampton Town at Sixfields. Defender Scott Wootton says Dons have to be more consistent if they are to get out of trouble. “There are still loads of games to go,” said Wootton. “George Williams was at Barnsley when they were around bottom at Christmas and ended up going up through the play-offs. “One thing is for sure: we need to put a string of performances together every week. Williams added: “If you put a run of results together, we can fly up the table.